Do you know the brand Pandora? I am sure you do. 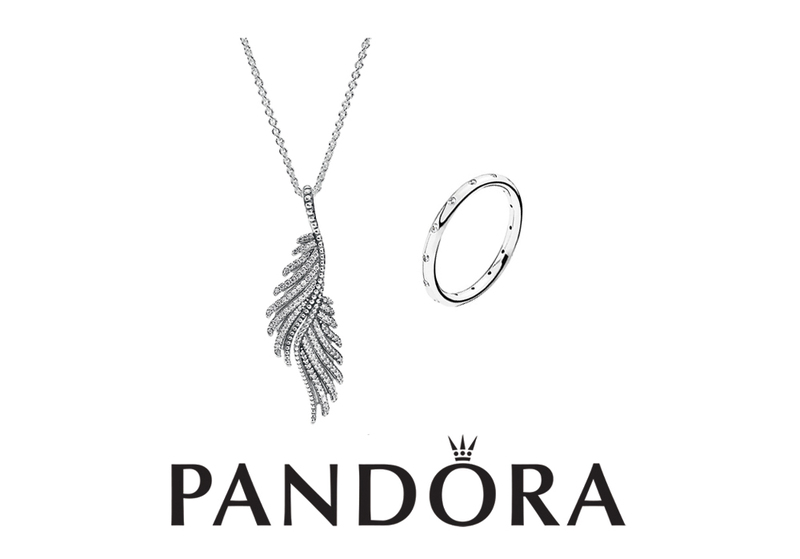 How do you like the idea of Pandora giveaway and the chance to win some amazing pieces of this brand? Pandora is famous of its bracelets with unique pendants. But Pandora offers much more than this. Today you have an opportunity to win a silver necklace with a pendant in the shape of wings, decorated with zircons - Majestic Feathers and a fine silver ring with cubic zirconia - Droplets, all with a total value of USD 190. The giveaway rules are the same as always. You need to follow this blog via GFC and leave your email. Please use the Rafflecopter form. If you would like to increase your chances of winning, share this giveaway on Facebook and on Twitter. This giveaway is open internationally and will run until 28.3.2016. Čo keby sme si dnes zasúťažili o šperky od Pandory. Určite túto značku veľmi dobre poznáte. Preslávili ju totiž náramky s tématickými príveskami. Hrať sa bude o striebrnú retiazku s príveskom v tvare krídel, zdobeným zirkónmi - Majestic Feathers a jemný strieborný prsteň so zirkónmi - Droplets, v celkovej hodnote USD 190. Pravidlá giveawaye sú ako vždy rovnaké. Musíte sledovať tento blog a zanechať na seba email. Použite k tomu prosím Rafflecopter formulár. Ak by ste chceli svoje šance na výhru zvýšiť, zdieľajte túto giveaway na Facebooku a na Twitteri. Giveaway je otvorená medzinárodne a pobeží do 28.3.2016. Thank you for the giveaway. I adore Pandora. Thanks for this amazing brand! you are amazing thank you!!! I love this beautiful Pandora jewelry, make a great gift for mother´s day. Amazing jewelry 👌 love Pandora jewels!!! Thank you for the lovely giveaway 😊!!! Great giveaway, I love Pandora !! Thanks !! Pandora has beautiful jewelry. I love their bracelets. Ty tvoje soutěže jsou světové. Myslím, že jsem ještě neviděla lepší. Мечтаю выиграть приз. Спасибо за конкурс. Good luck for all of us :) Great giveaway!!! Thanks Pandora for the chance. Everything here (in this blog) is great.. let me dream!! With your soap bubbles, with your advice, with this giveaway.. I love this and I love pandora! Thank you! Jeeejko nedalo mi nezapojiť sa :) ..Pandora je úžasná. Ahoj i love Pandora,thank you for the opportunity! awesome! Great giveaway <3 Thanks! I love Pandora! On Saturday I was in a Pandora store and admired all those beautiful jewelry! I would buy the entire store if I could.